The num ber of tourist arrivals to the Red River region has reached 35 million, earning revenue in excess of VND 35, 000 billion, up 15 per cent from last year. The figures were revealed at a ceremony in Haiphong on December 14 to mark the end of the Red River Delta Tourism Year. Attendees at the ceremony were given the results of regional tourism activities conducted throughout the year. 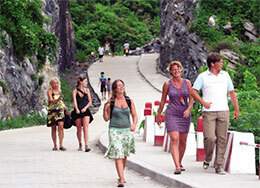 More than 4 million people visited Haiphong City in 2013, including more than 480,000 foreign nationals, representing an increase of 7.56% compared with last year’s figures. Le Khac Nam, Vice Chairman of the Haiphong City People’s Committee and Deputy Head of the Organising Board said one of the key tasks for the future is to assist travel companies and associations to develop special tourism products and package tours and continue to organise the annual Hoa Phuong Do (Red Flamboyant) festival to promote the city’s image.